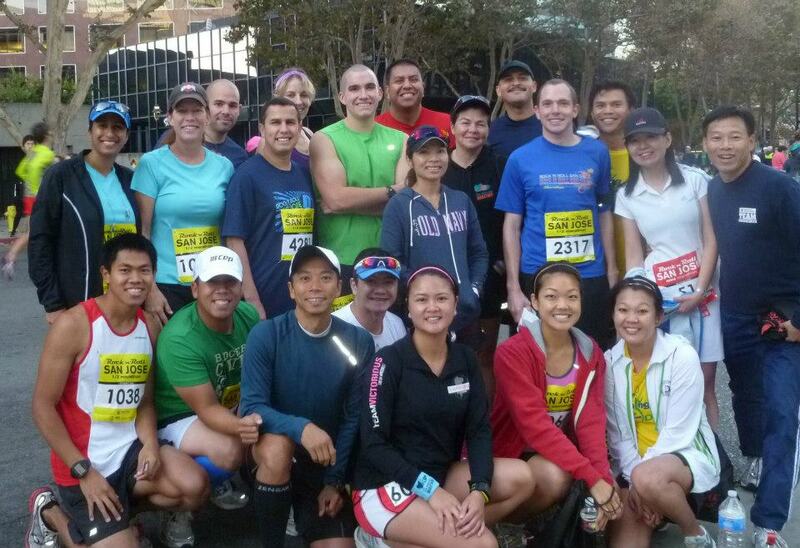 I met up with the Running Addicts Sunday morning for some group pictures before the race. I think there were more RA’s who weren’t here yet for the photo or they were in Chicago running a marathon. Either way, we were all running :)! And thanks to the Running Addicts who took so many great pictures! I was so scared about my knee hurting that I did something weird. I said a prayer with my three fingers on my lips and then when I was done and said, “Amen,” I touched my fingers to my knee. As soon as I did that, I thought it was the strangest thing ever… but oh, well. I had a feeling God would be taking care of that knee for the duration of the race. Starting out, I was with Cynthia. She wanted to run negative splits but took off much faster than we had talked about. AHHHHH! Haha, well, I just had to follow her and keep up. Basically, I was lucky to have her keep a challenging pace for me. There would be no way I would start out a run that fast and I realized I can run a much faster pace than I anticipated. There was definite slowing of the pace after the halfway mark but MAN am I lovin’ that 7:06 near the end! So my Garmin came out to a little more than 13.1, but whatevers. My official time? 1:41:57. I’m so glad I came in under 1:42 (even if it’s only by three seconds, hehe). That is more than 3 minutes off of my previous PR (personal record)! How great is that??? Unfortunately, I don’t have my USB cable with me so I can’t upload any pictures that I took from the race. Fortunately, you guys don’t care much for my poor-quality pictures to care, haha. I hope everyone who raced had a wonderful weekend. Great job to all the finishers! Praise God that my knee gave me no trouble during the race! YAY!!!! So happy!! Congrats on your PR hun! You’re most welcome! I know what’s it’s like to be injured, so I’m was super stoked to read that it went so well for you!